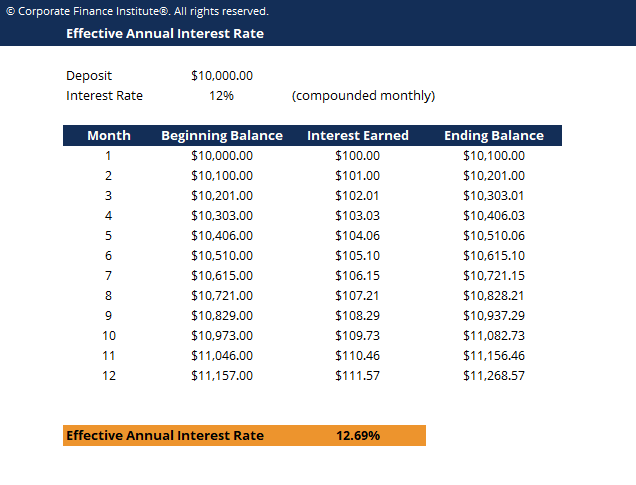 This effective annual interest rate calculator helps you calculate the EAR given the nominal interest rate and number of compounding periods. The Effective Annual Interest Rate (EAR) is the rate of interestInterest ExpenseInterest expense arises out of a company that finances through debt or capital leases. Interest is found in the income statement, but can also be calculated through the debt schedule. The schedule should outline all the major pieces of debt a company has on its balance sheet, and calculate interest by multiplying the actually earned on an investment or paid on a loan as a result of compounding the interest over a given period of time. It is usually higher than the nominal rate and is used to compare different financial products that calculate annual interest with different compounding periods – weekly, monthly, yearly, etc. Increasing the number of compounding periods makes the effective annual interest rate increase as time goes by. An investment that is compounded annually will have an effective annual rate that is equal to its nominal rate. However, if the same investment was instead compounded quarterly, the effective annual rate would then be higher.